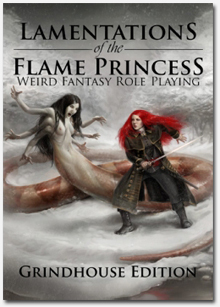 My campaign isn’t as suggestive or dream-like as many others; it’s in all honesty pretty bog-standard fantasy, although the frequency of monsters (humanoids especially) is dialed down a lot, inspired by LotFP’s philosophy of keeping things strange. Recently, however, I’ve begun introducing the more philosophical thought that adventurers and other bizarre fringe-creatures really are explorers of the “beyond”, that there’s something outside civilization which they dive into. It could be that “mythic underworld”, it could be the Fae encroaching on reality, but they go where sane people wouldn’t. And they also go places which civilization would rather see not exist at all, into the badlands, deep forests and dismal swamps. This adds a more suggestive feel to the classic “murderhobo”, they really are to be feared, not just because they are violent and follow their own strange morals, but because they enter the unknown, and who knows what they’re bringing back? The local peasants have been leaving offerings to the swamp hags for centuries, and apart from the occasional lost child there’s never been a problem. They don’t need the hags killed, and the definitely don’t need the hags angered. It also explains the PC’s powers and abilities; they have a touch of the fantastic on them, the mythical, and so they can access abilities and secrets beyond those who are afraid to upset the balance. One consequence, at least in my campaign, has been making the guardians of civilization more powerful, not less. Veterans have 2 HD, and knights have 3 HD, many NPC clerics are rather high level. They’re the strongest champions of the “normal”, the bulwark against dragons and undead and old gods; they should be powerful, although predictable and rarely in opposition to the PC’s unless they’re very actively spreading chaos in the lawful parts of the world. They are, to some extent, the future, the inexorable advance of civilization as it pushes the Beyond and claims new lands. I was worried that this might be a bit boring and predictable, but instead I find this trope is really helpful in play. My players hate the tax-men, bishops and barons who interfere in their work, and as they grow more powerful they become more and more of a threat to the established order, as criminals, rebels, “false” prophets and renegades. It generates conflict and flux – in other words, fun! A set of bag pipes. The bladder is made from the descaled skin of some deep-sea creature, and is a sickly purple. The mouthpiece is made from ebony, and carved in the likeness of a beautiful maiden. The four pipes are all made from bone (appears to be from a large horse, to one knowledgeable about such things), and are respectively red, white, black and ashen, Each is carved with a verse in old Latin (different for each pipe, see below) and smell of sulfur and dirt. The four bone pipes detect as magic, the rest of the item does not. Making noise with it is fairly easy, but actually holding a tune is no easier than playing a bag pipe. The magic of theses pipes is not released unless a tune of at least a few notes is played on them; the specific tune does not matter, it may even be improvised, but getting that far requires practice. 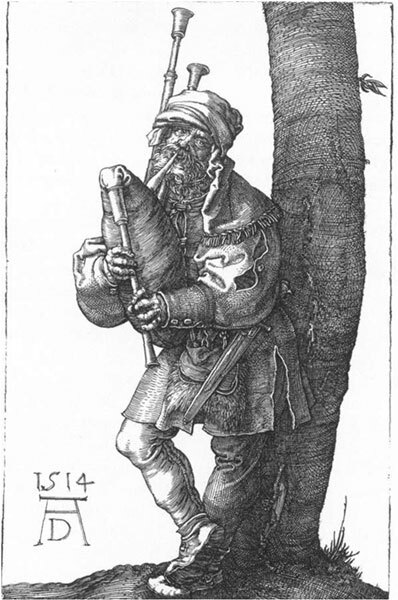 Treat “bag pipe playing” as a skill, with an average character having a 1/6 chance of making a pipe produce a melody. The real trick is playing several of the pipes together, and in harmony; this requires far more skill, as a -1 modifier is applied to the chance of success with this skill per additional pipe played. Each time a character successfully plays one of the pipes, allow him or her a percentage chance equal to INT to increase the skill value by one. Beyond 3/6 skill, however, this can only be rolled if more than one pipe is played simultaneously. Of course, a far easier (and safer) way to increase the “bag pipe skill” beyond 3 (up to that point, playing only the pale pipe is a safe way to practice) is to make another, non-magical bagpipe and use it for practice, as is finding a skilled musician and convincing/paying/fooling her into making a nice harmony for you. So, what do these pipes do? Well, it depends on what pipe you play. The effect listed below is applied on all living beings who hear the music except whoever is playing the pipes for as long as the music is heard, and a successful saving throw negates the effect, although a new save must be made each round the music is heard. Plugging your ears or casting a Silence spell are viable forms of defense, although the pipes themselves will instantly negate any Silence spell if played within its area of effect. They have no effect on soulless beings, such as animals. White I looked, and behold, a white horse, and he who sat on it had a bow; and a crown was given to him, and he went out conquering and to conquer. Struck by a virulent plague; act at -4 and lose D6 CON per day until dead. The plague is highly contagious, also efter the music has stopped. Red And another, a red horse, went out; and to him who sat on it, it was granted to take peace from the earth, and that men would slay one another; and a great sword was given to him. Fly into a murderous rage. Attacks any enemies in sight, but if none are available will progress to strangers and then lastly to friends and family. If no one is present, They will not attack the player of the pipes, but any of her companions are fair game. Black I looked, and behold, a black horse; and he who sat on it had a pair of scales in his hand. And I heard something like a voice in the center of the four living creatures saying, “A quart of wheat for a denarius, and three quarts of barley for a denarius; and do not damage the oil and the wine.” Taken by a horrible hunger. Eats anything edible in sight, and when food is gone will progress to any other at least edible things (textiles, leaves, paper etc), which causes 1 HP damage per round. After this, any other beings will be attacked to be eaten, and lastly the affected will eat herself. Ashen I looked, and behold, an ashen horse; and he who sat on it had the name Death; and Hades was following with him. Authority was given to them over a fourth of the earth, to kill with sword and with famine and with pestilence and by the wild beasts of the earth. Oddly, this pipe has no effect if played on its own. It does, however, have dramatic effects if played in harmony with the others (see below). It is when more than one pipe sounds at once that the truly horrifying power of these pipes are unleashed. However, attempting this unsuccessfully is very dangerous; a failed attempt to do so will strike the musician with the individual effect of each and every pipe played. Each of these effects is permanent, and will require a Cure Disease or Remove Curse spell to be removed. The effects produced below are not permanent, unless they are tied to playing the white pipe, in which case they remain alongside the plague. White+Red The murderous rage becomes part of the plague, and does not abate until the sickness is cured. White+Black The horrible hunger becomes part of the plague, and does not abate until the sickness is cured. 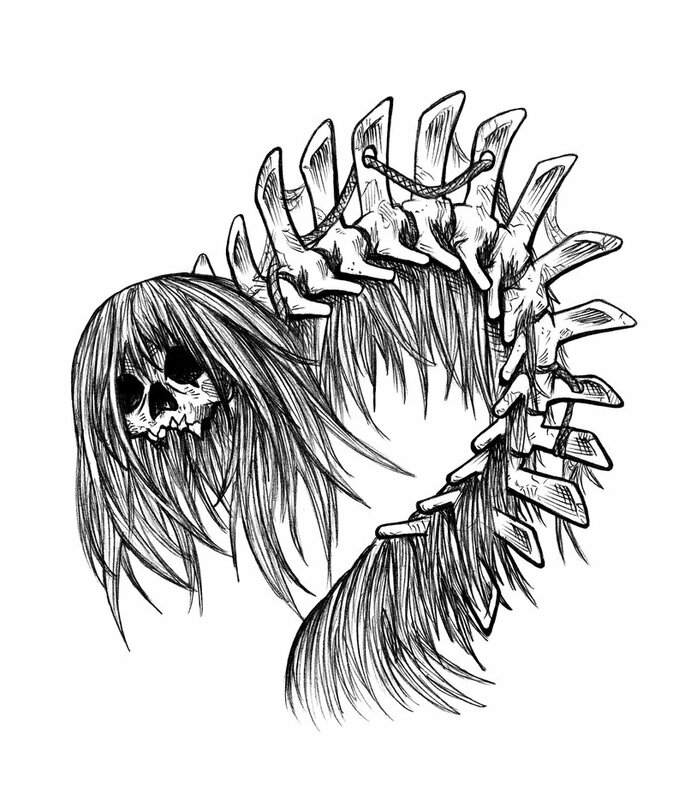 White+Ashen Anyone who dies from the plague rises as a 2 HD Undead creature, which is still a carrier of the plague. Red+Black The enraged will attack with bites trying to devour others, sating their hunger this way. Red+Ashen The rage will affect even corpses, which will rise or claw their way out of the ground and go on a rampage as 2 HD Undead. Black+Ashen If possible, the affected will eat other living beings first and after this corpses or decayed flesh. White+Red+Black The enraged attack with bites as above, and this effect becomes part of the plague. White+Red+Ashen The murderous rage becomes part of the plague, and anyone who dies from the plague rises as a 2 HD Undead. Red+Black+Ashen The enraged will attack with bites trying to devour others, and once having fed this way will turn into 2 HD Undead who crave nothing but living flesh. All pipes Zombie Apocalypse! Or, to be more specific: The plague will cause the enraged to attack with bites trying to devour others, and will also cause anyone killed by it or by a carrier to rise as a 2 HD Undead, which craves living flesh. Beastmen come in many shapes and sizes; their chaotic nature means they are of an almost infite variety. There are some larger and slightly more homogenous groups, however, and these have been given names by the human tribes which are still in common usage. All beastmen are aligned with Chaos; a few very rare number of outcasts or isolated communities may control their beastial natures and act in more civilized manners, but their allegiance is in their blood and not so easily removed. BROOD are minor beastmen, often very twisted by their bestial parts, hunched and perverted and with limited intellect. They are easily dominated by the larger Bray and are seldom found alone. They are little more than slaves in Beastman society, and their morale is terrible; if their Bray leaders fall, they are sure to scatter. The Brood in a single area typically display the same animal traits (see below) which might modify their statistics and abilities slightly. BRAY are the powerful warrior caste among the Beastmen. They are the same species as Brood, but their chaotic and bestial nature is more pure leaving them taller, stronger and smarter, with an intellect approaching that of a human. Bray are lazy and boorish creatures, but fierce warriors who often lead raids into human lands to steal cattle, abduct fair young men or women or to simply kill and burn in the name of their Dragon gods. The Bray in a given area are usually of the same animalistic nature as each other, but not always, and frequently Bray of one animal nature dominate Brood of an entirely different one. BRAY SHAMANS are devoted to worship of the Old Dragons, a practice almost unheard of among the other intelligent races. It is unclear if and how these dragons can answer prayers in a meaningful way; these shamans do use magic, but it appears to be of a sorcerous nature. They have all the powers of a 3rd level Magician with 5 randomly determined spells. BRAY CHIEFS are the warlords and chieftains of their people; very few of these creatures remain alive, but at this power these beings do not appear to age normally and thus some of them have been around for a very long time (these ancient individuals should be granted anywhere from 1-3 additional levels). 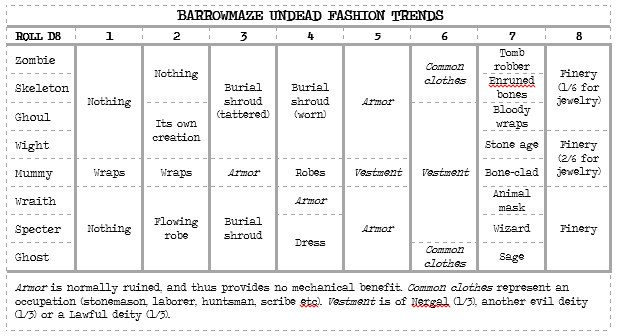 Many of them carry magical treasures or wield magical weapons (as per the treasure rules, they are apt enough to use any items they possess not specifically restricted to Magicians). TAURUN are rare among the beastmen; an individual whose nature is so powerful it makes them grow to a huge size (around 12′ tall is the norm, but this varies widely). Unfortunately, most higher intellectual function shrinks with it, and these beasts remain among their lesser brethren serving as laborers and bodyguards. They attack twice in combat, using huge fists, horns, beaks, claws or whichever natural weaponry their chaotic nature has bestowed them with. Beastmen are hybrids of men and beast, in essence; their chaotic nature means they are both less and more than that, and they are able to breed amongst themselves indiscriminately as well as breeding true with humans and sometimes even with animals. In an area, tribe or clan of these creatures, one or possibly two traits usually hold sway due to inbreeding and natural selection based on the environment. Below are some examples, although many more possibilities exist.